Welcome to Your Travel DNA! We came upon the unusual idea for our Distinctive Navigator Analyzer or DNA one day in the company kitchen during a casual conversation. We quickly recognized that we had hit on something. It is not unusual for a traveler or a travel agent to contact us and ask us where they or their client should go. They may have the ‘what’ and ‘why’ but not necessarily the ‘where’ yet. This idea for yourtraveldna.com was confirmed as we thought about the many stories we have heard from travelers who planned vacations based on the advice of others – relatives, neighbors, friends, but were ultimately disappointed, even when the journey was successful. We created a place where both travelers and travel professionals can come to explore each individual’s life interests, and where those interests may lead. Here, we reverse the expected process currently accepted in planning a vacation. Instead of fitting the guest into a destination, with DNA, you can discover the best destinations for you that speak to your particular interests and passions whether you are an Adrenalin Seeker, a Culture Junky, a Star Gazer or something more. With this simple tool, you open up a world of possible ideas – destinations that genuinely excite you with places you may never have considered before. We suspect some of the destinations will surprise you. 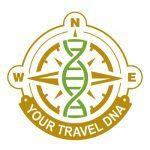 The site is free and easy to use, and you can use yourtraveldna.com as often as you like to explore and define possible destinations for your next great adventures. You will get a personal Travel DNA profile emailed to you in a PDF that you can print out or email to friends or your travel professional to begin exploring travel ideas. Get started on the road to discovering Your Travel DNA, click here.